Before we get down to the nitty gritty of storage heater controls, it’s important to get a good grasp of how storage heaters work in a broader sense because they operate very differently to other mainstream heating solutions. Storage heaters charge up overnight and store heat in thermally retentive bricks so that warmth can be gradually released during the day. This alone can be confusing enough for some: “Why would you want to store heat? Why not just use it straightaway?” Well, the reason for this is that storage heaters are designed for use with a special electricity tariff called Economy 7 which offers night time electric rates at a cheaper price when demand is lower. Though the daytime prices are inflated by comparison, owners of storage heaters avoid using these more expensive rates because they have access to the stored warmth created by their storage heaters, which they can use as and when needed during the day. Some households swear by Economy 7 heaters as a way of keeping heating bills low but it can take a bit of getting used to if you’ve only ever known central heating. As storage heaters need to charge at night, it means that you’ve got to estimate how much heat you’ll need for the coming day. This is where the controls come in. There are a lot of different kinds of storage heater out there but for the most part they will use two dials for operation. These two dials may be labelled ‘input’ and ‘output’, or possibly ‘charge intake’ and ‘room temperature’. No matter which it may be, they’re both ways of saying the same thing: one dial controls the amount of stored heat and the other controls how much heat is released into the room space. Both the input and output dials will display the numbers 1 – 5 or 1 – 6 depending on the brand of the heater in question. If you’re unfamiliar with storage heaters, the numbers may feel a little alien but it can help to view them as a simple sliding scale between the minimum and maximum input or output capabilities of the heater. The minimum is indicated by the number 1 and the maximum is indicated by the highest number on the dial. To select your storage heater’s input, all you need is a little bit of common sense. If you know it’s going to be particularly cold the next day, you should set your input to maximum the night before to ensure that you’ve got plenty of warmth to see you through to the evening. During the summer months, you may only ever need to set charge to 1 or 2 to store enough heat for the evening, or you may not need to charge it at all! Just bear in mind that with manual storage heaters, it’s up to the user to set charge intake in response to changes in weather so try not to forget to adjust your heaters before you go to bed. As the input dial regulates the amount of overnight charge, this will also have an effect on how warm your room spaces are in the morning. From the moment the heaters start to charge and store heat, this accrued warmth is conducted through the thermal bricks and the housing of the heater, eventually radiating out into the room. This is why the surface of a storage heater is hottest during the morning and gradually starts to lessen over time. Sometimes, this radiant heat will be all you need to keep the room warm during the day so you won’t have to amend the output control, but when it gets cooler in the evening, that’s when you might have to start making adjustments. Storage heater output requires a little more care and attention on the part of the user. When the output dial is turned, a flap is opened within the heater which controls how much heat is released into the room. Setting the output to maximum will release heat quickly – which may be beneficial in some situations – but be mindful that it’s much easier to run out of supply this way. Once you run out of stored heat during the day, you’ll have to use a supplementary heater to top up your temperature levels, which is not an ideal choice considering any electricals will be using the more expensive daytime rates of Economy 7. It’s best to leave output controls on a low setting to provide a steady release of warmth throughout the day so that during the evening there will be more heat left if you need to offset the cooler temperatures. Just remember to set the output dial back to 1 before you go to bed to retain as much stored heat as possible overnight. While you might need to make more frequent adjustments to your heating compared to other methods, the modularity of storage heaters can be very advantageous. Their individual controls mean you can zone your heating throughout your home and reduce input and output accordingly for spaces that get used less often. Storage heaters have benefitted enormously from modern innovations and newer models do away with these dials altogether in favour of high-tech digital interfaces. 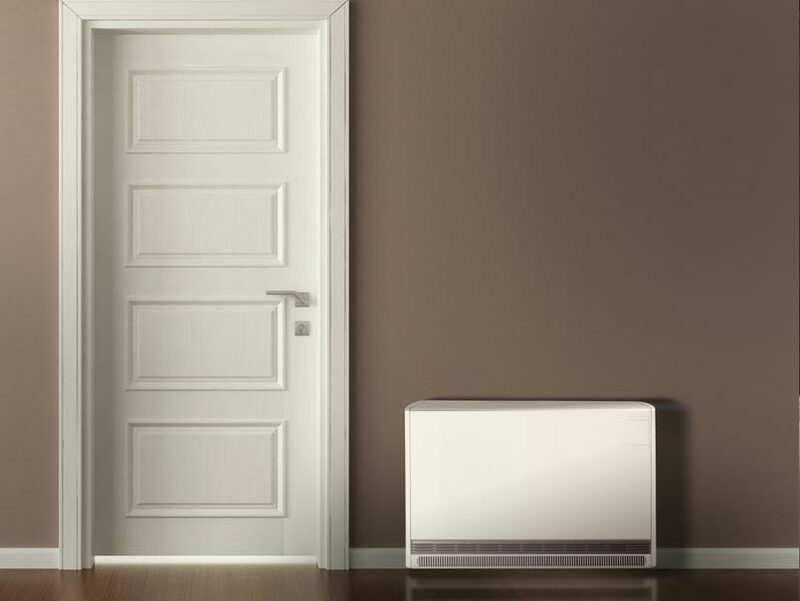 Cutting-edge smart storage heaters such as the Elnur Ecombi remove much of the hassle of controlling input with intelligent sensors that can predict charge requirements ahead of time. If you prefer a more accurate way of managing your room temperature, the Ecombi also allows you to select a comfort temperature in °C which it will automatically maintain without any further user interaction required. Add into the mix a weekly programming feature and you’ve got a storage heater system that’s convenient and even more economical. Start by setting your input to midway and see how you fare for heat the next day. If you run out, turn it up; if you’ve got plenty left over, turn it down to the next setting. By experimenting with your heaters, you’ll eventually find the ‘sweet spot’ for the settings and won’t need to adjust them quite so frequently. Set your output to its lowest setting before you go to bed to prevent heat loss and wasted energy overnight. Keep the seasons in mind – turn input down during the warmer months and up during the colder months. If it’s very warm, save money by switching your storage heater off at the wall. Once your room is a comfortable temperature, turn output down again to prevent overheating the space and to retain as much heat as possible for the evening. Zone your heating effectively. Infrequently used rooms should have input and output set low to save energy. Following these simple tips will help you to get the most out of your storage heaters and will certainly help to minimise your energy usage. Don’t be shy – get to know your storage heaters and they’ll provide you with many years of economical home heating.